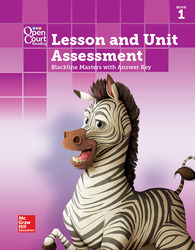 Lesson and Unit Assessments Blackline Master with Answer Key measures students’ learning in key instructional areas such as: word analysis, vocabulary, comprehension, and grammar usage. Formative assessments help teachers plan differentiated instruction in the classroom. Book 1 of 2.